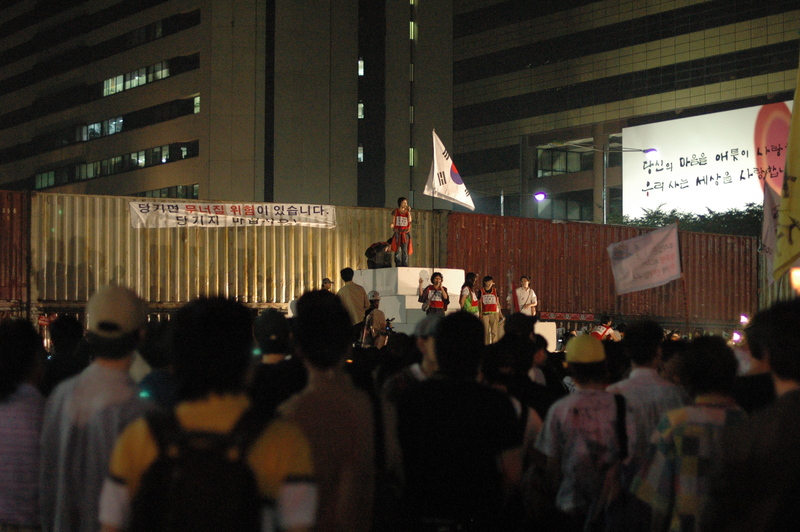 In examining the Candlelight Vigil protest of June 10, 2008, held in commemoration of the June 10 Democratization Movement in 1987, I argue that the Candlelight protesters deliberately sought to reformulate Korean nationalism in the conflict between their conception of democracy and the market economy. In addition, the Candlelight protesters’ nationalism was very much shaped by the Internet and online networks in the era of globalization, so it robustly challenged the earlier conception Korean nationalism that was much influenced by the conventional concept of the national boundary. The Candlelights imagined their nationalism as a dialogical point within the context of international collaborations struggling against the ever-growing prominence of neo-liberalism and collectively working towards a globalized world in which they want to live. Nevertheless, the protesters’ imagining of their nationalism outside of the conventional political system had somewhat limited their potential for reworking the current socioeconomic structure. In opposition to the state’s nationalism, these intellectuals and university students envisioned minjung as the sovereign power of the Korean people’s nation-state. They defined the idea of minjung as “the common people,” in opposition to the elites, the educated, and the state; thus, the minjung is conceptualized as being alienated from the political decision-making process and from capitalist production, at the same time as its constituents serve as the building blocks of capitalist society.9 They are a “group” that cannot be neatly categorized within existing notions of classes or other specific social groups, and yet they were capable of rising up in opposition to “the meta-narrative of state-led development” as “a true historical subjectivity.”10 Nonetheless, the idea of minjung, a sweeping term that purports to represent all of the oppressed, tends to gloss over particular problems of other social minorities such as women, prioritizing its political agendas over others. When defined by its dynamic engagement with historical reality, the dissidents’ idea of minjung is firmly grounded in their perception of modern Korean history, particularly in its failure to build a sovereign nation-state after liberation in 1945. The dissidents perceived that the legitimate foundation of the Republic of Korea was obstructed by the re-entry of pro-Japanese collaborators into politics, anti-communism, the division of the nation into South and North Korea under the U.S. Army Military Administration, and dictatorships and foreign interventions.11 For that reason, the legitimacy of the foundation of the Republic of Korea and the undemocratic regimes that followed (1948-1992) has long been contested. Unlike the undongkweon, the Candlelighters harbored no doubts about the legitimacy of the Republic of Korea per se as their nation-state. Because the Grand National Party’s presidential candidate Lee Myung-bak was democratically elected by a majority of voters in 2007, legitimacy should not have been a problem in principle. However, because the Candlelight participants perceived that Lee’s government did not represent the interests of the citizens or listen to their expressions of concern—instead heeding the interests of the establishment and the U.S.—they challenged its legitimacy as their state. The protesters believed that they needed to guide the government to work properly, and that if it did not listen to its citizens, it should be overthrown to make way for a new state. Nonetheless, the Candlelight protesters were skeptical about aligning with dissident nationalism and its progressive politics, not only because they had failed to deliver their promises even after democratization (1987), but also because their approach to current socioeconomic problems differed little from those of the conservative party. 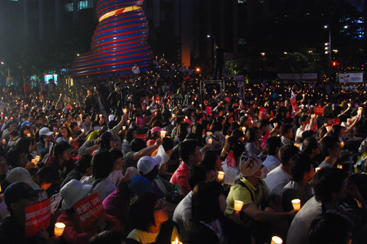 Although the Candlelight participants shared, as well, a yearning for a people’s nation-state, if the undongkweon imagined its nationalism in the meta-narrative of “the nation, minjung, and democracy,” the Candlelight protesters re-imagined their national community in their everyday civil discourse through self-organization. Ndebele’s theory of the ordinary speaks to the Candlelight protesters’ deliberations, particularly how they conceptualize everyday life, not only as a powerful thrust for a collective re-envisioning of their nation-state, but also as a place where their activism is rearticulated in the everyday practice of democracy. The Candlelight protesters enacted the idea of the everyday practice of democracy through free, boundless exchanges of thoughts, opinions, and information in a common arena, such as the online community Daum Agora, envisioning a democratic civil society in these activities. 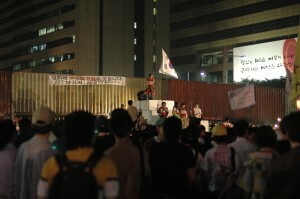 The protesters expressed such an ideal of democracy in their action of civil disobedience in front of the shipping container barricade on June 10, 2008. By doing so, they projected their aspirations within a counterpublic space for their new national community. Before looking into their community-making actions, I will examine the socioeconomic background in South Korea following the 1987 democratization. The Ch’eonggye Plaza was flooded on May 17, 2008 with thousands of lit candles, offering a magnificent spectacle. The Ch’eonggye Plaza was created by the Ch’eonggyech’eon reclamation project during Lee Myung-bak’s tenure as Mayor of Seoul (2002-2006), and it was considered his most visible achievement. However, it became the site of protests against his government that night in 2008, as a banner was unfurled reading: “No Mad Cow, No Mad Education!” Men and women, young and old, came with their families and friends and sat on the ground in the packed space, enjoying performances by popular singers, as if they were at a summer picnic. In the middle of the concert, the audiences shared their ideas on current politics and others responded with enthusiastic applause and speeches of their own. It was not only through speeches and anti-2MB pamphlets that people showed their opposition (“2MB” is a derisive nickname for President Lee that pokes fun at his brain capacity—2 megabytes); many people also brought their own signboards and wore costumes as gestures of protest, for example cow costumes (presumably representing mad cows) and masks from the movie V for Vendetta. Figure 1. The Candlelight Cultural Festival at Ch’eonggye Plaza, 2008. Photo by Kim Yunki. Figure 2. The Candlelight Cultural Festival at Ch’eonggye Plaza, 2008. Photo by Kim Yunki. The Candlelight cultural festivals, which would develop into the Candlelight Vigil protests, were started less than one hundred days into Lee Myung-bak’s presidential term (2007-2012). Lee, the candidate from the Grand National Party, was elected president in December 2007. His election was expected, not only because the preceding president Roh Moo-hyun and his Progressive Party had failed to represent the people’s interests in a term that began in 2002, but also because the 1987 democratization movement had not successfully represented the people’s interests in building a new democratic society and establishing socioeconomic justice, a state of affairs widely believed to have worsened as a result of the IMF (International Monetary Fund) intervention (1997). Although the IMF crisis united Koreans through their collective efforts to regain Korea’s sovereignty, it violently broke apart their everyday lives in a way no one had expected, causing a daily suicide rate of twenty-five people and a fifty percent increase in the crime rate.21 As the central goal of the IMF reform package was to make the labor market more flexible, salaried workers suffered under a bleak job market and economic slump. As a result, the middle class became more focused on the success of family members. The rhetoric of competition dominated all aspects of people’s lives as never before. The conservatism of the middle class rapidly separated the civil and labor union movements, resulting in the exclusion of workers’ interests and perspectives from the formation of political discourse.22, 198.] This meant that civil society had lost the biggest latent force of resistance against business conglomerates (including mass media powers) and the government.23 As several commentators have pointed out, many factions in the civil movements became apolitical and did not bring class-consciousness to the forefront, focusing instead on the interests of the educated middle class. Nonetheless, these developments reflect changes in the social movements of the late 1980s and 1990s. After democratization, many activists and social organizations found it difficult to replicate their earlier mass mobilizations because there was no common target, as there had been in the pre-1987 era.24 As a result, new civil associations and non-governmental organizations (NGOs) began to work with the emerging civil society. These civil society groups addressed a wide range of new social issues, and their members included ordinary citizens, journalists, professors, social workers, artists, and farmers.25 The development of grassroots NGOs accelerated rapidly and spread nationwide, ushered in by the new national online network. Globalization and neo-liberalism tightened their influence over Koreans, and their effects were deeply felt in everyday life. Under these circumstances, Lee Myung-bak’s promise to promote the resurgence of Korea’s economy was eagerly received by the public. However, many of his policies, such as the liberalization of education and the privatization of medical insurance and other public services, provided little benefit to the average Korean. Furthermore, his ambition to create the pan-Korea Grand Waterway was anti-ecological and public work-based, which seemed to repeat the 1960s and ’70s style of economic development. The people were forced to confront the reality that the government’s vision for the nation-state clashed with that of the people. Above all, what brought about strong opposition to the Lee administration, eager to create a better relationship with the United States, was its decision to import U.S. beef. Such importation included meat and other body parts from thirty month-old cattle that had been banned from the U.S. food supply because of the perceived high risk of mad cow disease. Many Koreans were incensed at the government’s humiliating deal with the United States, particularly its failure to protect its population, and indeed its apparent indifference to food safety. However, the government did not renegotiate the agreement, prioritizing economic logic and South Korea’s ties with the United States above all else. Many people believed that the government’s deafness to the desires of its citizens led directly to this decision and was the biggest obstacle to true democracy in Korea. They viewed the unresponsiveness of the government as undemocratic and, instead, envisioned democracy as an everyday civil discourse among people of varied opinions. When Lee’s government announced the liberalization of education at almost the same time as it signed the U.S. beef import agreement in 2008, many female junior high and high school students, who were already living under severe pressure to achieve academically, called the current education system “mad education,” comparing it to the beef import in their slogan “No Mad Education, No Mad Cow!” The young students, known as the Candlelight Girls, appropriated social media and used it for creating political dissent. Their creative and techno-savvy methods of networking represented a new form of protest to many people, although these technologies had existed for a while. The initiative of these young students invited people from all walks of life to engage with everyday concerns and respond to them in a communal manner. Their exchanges evolved into the Candlelight cultural festivals at the Ch’eonggye Plaza where thousands of candles created a magnificent spectacle. The government’s unresponsiveness to its citizens’ desires resulted in the summer-long Candlelight Vigil protests, which were brutally combated by the police. Many Koreans were afraid of mad cow disease due to the extensive media coverage of the epidemic, online journalism, and citizen networks. What was known about mad cow disease became highly politicized and muddled by conflicting scientific ideas, by the news media’s negligence or manipulation of “facts,” and by the fear propagated through blogs and online networks. Nevertheless, the Candlelight Vigil protests were not driven simply by fear and ignorance. In the midst of the fear-mongering, the true nature of the government and the conservative news media was revealed. 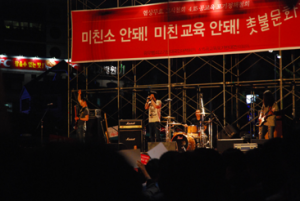 Although the Candlelight protesters supported the anti-government news media, in their re-envisioning of a democratic Korean national community they also distanced themselves from progressive politics. On April 29, 2008, PD Note broadcasted a television program on mad cow disease, titled “The American Beef, Is It Safe from the Mad Cow Disease?” The program showed alarming images of downed cattle and individuals who supposedly suffered from the human variant of mad cow disease. The program also claimed that 94 percent of Koreans have genes that can make them more susceptible to developing vCJD (variant Creutzfeldt-Jakob disease, the human mad cow disease). However, this information had not yet been rigorously verified. The government and the conservative newspapers Chosun, JoongAng, and DongA Daily accused PD Note of fabricating and distorting information to manipulate public sentiment to further the leftists’ political agenda.32 The government and the conservative newspapers continued to portray the Candlelight Vigil protests as illegal, violent protests influenced by anti-government, anti-American instigators. For instance, newspaper editorials ran headlines such as “The Candlelight Vigil Protests Become Anti-Government, Illegal Protests,” “The Candlelight Vigil Protests: It Should Not Spread a Banquet for Wrong Groups,” “Instigation by Ghost Stories and False Information, It Goes Way Too Far,” and “[The Government] Should Take a Decisive Measure Against the Violent Protests According to the Law.”33, 191.] This rhetoric gave the government a rationale for forcefully suppressing the protesters to reestablish law and order. Using nationalistic rhetoric, the government and mass media outlets accused the Candlelight protesters of undermining Korea’s democracy and of causing the current economic crisis. Above all, what concerned these powers most was that many ignorant people would be alarmed by the information on mad cow disease and manipulated by anti-American and anti-government groups. The pro-government newspapers clearly demonstrated their willingness to switch their stance depending on their immediate political and economic interests by manipulating public sentiment, obstructing the people’s access to the facts. In the face of competing “truths” regarding mad cow disease, the protesters’ agenda was not simply about opposition to importing American beef, the overthrow of the 2MB government, or revealing the mass media’s manipulations. The Candlelighters’ aims were more fundamental to resolving the country’s deepest problem: remaking the Republic of Korea from the ground up on the basis of democratic ideals. Hence, the protesters playfully yet carefully maneuvered visual images, performances, and rhetoric to cast themselves as democratic citizens and to push the Republic of Korea closer to its ideal of a new democratic national community. 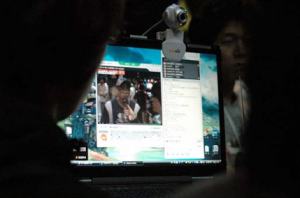 Such massive online participation was made possible by the widespread Internet access afforded by the network infrastructure of South Korea, the most heavily connected country in the world. Extensive online availability made the Internet an effective instrument for challenging the existing political system in both creating dissent and in forming on- and offline communities committed to social mobilization. Interestingly, the Koreans’ online interactions often have developed into off-line social movements, shaping and shaped by public sentiment, as the 2002 presidential election illustrates so well. When candidate Chung Mong-jun withdrew his support for Roh Moo-hyun, a reformist candidate, on the night before the election, an Internet newspaper providing citizen journalism, ohmynews, published an article on the new electoral development that was accessed by more than 570,000 people within the ten hours that preceded daybreak. Its discussion boards were flooded with messages urging the people to vote.36 Netizens also used cell phones to urge voters to exercise their rights on Election Day, thereby helping to elect Roh as president in 2002. As this example shows, the people’s involvement in on- and offline politics in 2002 shares some similarities with the Candlelighters’ online communities and activism. The immediateness of the connection between online networks and offline activism throughout the development of the Candlelight Vigil protests demonstrates not only how online communities can work with popular movements but also the tenuousness of the distinction between on- and offline communities. For instance, as a way of intervening in the pro-government news media, citizens wanted to represent their activism in their own terms. Some protesters carried their laptops, microphones, video camcorders, and cell phones into the demonstrations. While they were recording and uploading the protests in real time, they also interviewed other Candlelight protesters. People at home or in offices who could not make it to the protests responded directly to these real-time broadcasts. In turn, they often asked citizen reporters to go to certain spots where they had heard that police violence was taking place. Sometimes, if those at home or at work found things were getting serious, they came out and joined the scene of the protests—even in the middle of the night. Such citizen reporting exemplified how porous on- and offline networks were and how participants collaborated to achieve their political goals. Figure 3. One-Person Reporters. Photo by Kim Yunki. Figure 4. One-Person Reporters. Photo by Kim Yunki. I, a middle-aged woman, have never participated in political protests ever before in my life. [But] I decided to go on the picnic of Daum Agora . . .
As hyan’gi naneun maeul’s comment indicates, many of the Candlelighters who participated in Daum Agora defined their identities through the free interaction of ideas and opinions and the decision-making process, calling themselves Agorians. The Agorians projected their re-envisioning of the Republic of Korea through their online discourse. This vision was clearly manifested again in the Candlelight Vigil protest on June 10, 2008. In order to explore their new community, I will identify four moments during the course of the protesters’ engagement with the Myung-bak Fortress on that day, forming a progression in the re-imagining of their new national community. In commemoration of the June 10, 1987 Democratization Movement, the Candlelight protesters planned the One Million Candlelight March for June 10, 2008.38 The Candlelight protesters anticipated June 10 with great excitement but also with some anxiety over whether their protests would be a major watershed. This protest was accompanied by memorials for the martyrs Lee Hanyeol and Lee Byungryel.39 The death of Lee Hanyeol, who was killed by a police tear gas canister in June 1987, proved once more the state’s brutality and undemocratic nature and provoked the nationwide democratization movement that ended Chun Du Hwan’s military dictatorship. Twenty-one years later, Lee Byungryeol, a public transportation worker, immolated himself while protesting the importation of U.S. beef and the privatization of public service sectors, at the same time advocating the overthrow of Lee’s administration. His death somberly illustrates how the Korean people’s yearning for the democratization of society had not been fulfilled even twenty-one years after the death of Lee Hanyeol. Because of the significance of June 10 in the history of democratization, the government was also preparing for the possibility of the biggest anti-government protest in twenty-one years—since the 1987 Democratization Movement—by building a two-story barricade of shipping containers in Gwanghwamun, Central Seoul, a few blocks away from the president’s office. The police filled the containers with sand bags and coated them with industrial grease so that people would be unable to scale it. The protesters interpreted this barricade as a visual articulation or hypostatization of the president’s will not to communicate with the people.40 In response to government’s use of shipping containers—ironically symbols of trade and communication—to figuratively block dialogue, the protesters re-appropriated the barricade as a stage for criticizing and mocking the government with humor and satire. Figure 5. Myung-bak Fortress, June 10th, 2008. Photo by Kim Yunki. In the 21st commemoration of the June 10th Democratization Movement, [the government] responded with a pro-government counterattack and the container blockage. . . . However, [the container wall] exposes the incapacity of the Lee government, and as the symbolic structure of the deaf government, it will be the worst monumental blemish remembered in history. Because of the status of the hero Yi Sun-shin (the admiral who led several victories against the Japanese invasions in the sixteenth century), [the police] confused [the Gwanghwamun intersection] with wharfs, but even confusion should have some limits. The tourist attraction in the Gwanghwamun intersection makes [the site] perfect for a one night, two days’ tour. Although [the police] worked hard to construct it, causing traffic jams since the morning . . . it would be so much fun if the citizens don’t show up . . . . It’s so ridiculous. The playful satire of the protesters was a tactic in their effort to counter the staid politics of the government, which many people viewed as either lacking imagination or stuck in a 1960s and ’70s mentality in twenty-first century Korea. The consciousness gap between the government and the protesters might also be regarded as illustrating their alternative ideas about Korean democracy, and the urgency felt by the people in taking action to protect their emerging civil society. The Candlelight protesters’ attempts to re-envision the people’s nation-state were manifested in their conceptualization of the barricade as the imagined territorial line between two nation-states: that of the people and that of the government of Lee Myung-bak. Their statement, “This is a new border of our country. 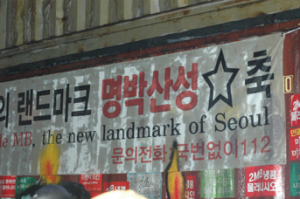 From here starts the U.S. state of South Korea,” implied that the barricade served as both a spatial and conceptual division between the two nation-states.45 It also expressed the people’s strong feelings of betrayal and alienation toward their own government, which had a more amicable relationship with its foreign allies than with its own citizens. For them, the government’s exclusion of the protesters proved its illegitimacy as the representative of the Korean people and pushed the protesters to fashion their own nation-state. In his essay “From Their Nation-State to All Our Nation-State,” the philosopher Kim Sangbong argues that the Korean state authority has never considered the people as citizens of the nation but rather as its potential enemies.46 (Seoul: Kil, 2008), 322–73.] That the first mass firing on protesters by the military during the Gwangju Uprising in 1980 started with the national anthem playing from speakers in the Gwangju city hall47 suggests that the people have never fully belonged to the Korean nation-state.48 The state’s disregard for the people and the atrocities it committed ignited their unrelenting desire to realize their own nation-state in opposition to the existing one. The Candlelight participants’ nationalism can be read in a similar vein, but it is very much shaped by Korea’s globalization. Here, if dissident nationalism was created by the dissident intellectuals’ engagement with Korea’s postcolonial condition, one must ask: after “the first year of globalization (segyehwa)” was declared by Kim Young Sam’s government in 1995, how might nationalism adjust and further transform itself, given that a younger generation of Koreans had not grown up under the same nationalistic state rhetoric?49 To distinguish the Candlelight participants’ nationalism from the earlier state-sponsored or dissident nationalism, I will explore the forms of nationalism manifested in the IMF crisis and the 2002 Japan-Korea World Cup Game, not as starting points for a new nationalism but as the backdrop against which the Candlelighters articulated their fiercely-felt identification as Koreans. What I found interesting was the reactions of teenagers. [The teenagers] who are eating pizza and hamburgers, enjoying Japanese comic books, and following foreign fashions actively participated in “the patriotic march.” On the one hand, I was amazed at the power of media, which pushed them [in that direction]. On the other hand, I was surprised at the fact that the consumerist new generation, who did not seem to be interested in patriotism, participated so readily in the patriotic march. . . .
Jo-han suggests that the teenagers’ consumerist attitudes allowed them to buy into nationalism eagerly, and to appropriate the national flag like it was any other brand. Although such an interpretation is plausible, the questions remain: what is nationalism’s appeal to Korean teenagers? And does their participation in patriotic rituals in fact indicate some change in Korean nationalism? Before I answer these questions, I want to explore the 2002 Japan-Korea World Cup tournament as a means of explaining changes in the people’s attitudes toward the Korean nation-state. Among these commentators’ diverse perspectives, I want to focus on a few interesting points: the young people’s voluntary participation in a nationalistic event; their desire to represent themselves collectively through various forms of performance or by appropriating state nationalism’s symbols for their own purposes; the Red Devils’ strong awareness of what they represented to the global audience; and Korean nationalism, as it embraced the people’s multiple and individual aspirations in fluid form. In addition, the Red Devils’ massive cheering at city hall and their pride as citizens of the Republic of Korea indicate that it is difficult to discuss current Korean nationalism within the frame of earlier forms of nationalism. Korean nationalism, as a malleable form of imagining the Korean nation-state, was in 2008 more inclined toward re-envisioning the people’s national community in the ideal of democracy by reworking many of the features already manifested by IMF nationalism and the 2002 Japan-Korea World Cup. How, then, did the Candlelight protesters re-imagine their nation-state according to democratic principles, as promised in the Constitution? First, they manipulated the dissident discourse contesting the Republic of Korea’s legitimacy to in turn question the legitimacy of the Lee government specifically and to drive a wedge between the people and the government. At the same time, they carefully controlled their political discourse so as not to be subsumed by existing leftist politics. Second, the Candlelighters articulated their vision of the Korean nation-state as a democratic civil society through the rhetoric of the everyday practice of democracy, as well as through multiple performances. In order to question the Lee government’s legitimacy, the Candlelight participants revived the earlier dissident rhetoric of legitimacy involved in the foundation of the Republic of Korea and its perceived sympathy with authoritarian governments. The Koreans have long questioned the failure to eradicate pro-Japanese collaborators when the Republic of Korea was founded; many people believe that these “traitors” continued to prioritize their and their allies’ interests over those of the Korean people at large, distorting the fate of the Korean nation. Likewise, the protesters perceived the Lee government’s pro-United States attitudes to be similar to the pro-Japanese collaborators’ betrayal of Koreans during the colonial era (1910-1945). The protesters’ crude logic was in fact a powerful discourse of identification for the members of the Korean national community as such, while excluding the government and its history of pro-Japanese collaborations or relations with dictatorships. Many people strongly believed that the government and ruling party’s half-hearted engagement in the colonial past (i.e., a few ruling party members’ participation in the fiftieth anniversary of Japan’s Self Defense Forces in 2004) and its hard-line North Korea policy resulted from the fact that some members of the government and the establishment were descendants of the pro-Japanese collaborators or colonial sympathizers. Nonetheless, some commentators viewed with concern the protesters’ “othering” of President Lee and the government as xenophobic nationalism, especially because the protesters had stressed the president’s birthplace: Osaka, Japan. By focusing on this in their critiques against President Lee, these commentators suggested, the Candlelight participants marked the president as Japanese in order to control the national boundary or to take advantage of the Koreans’ general hostility against the Japanese. However, their pun, which involved changing the name of the ruling party Hannara-dang (The Grand National Party) to Ttannara-dang (or, literally, “party for another country”), suggests that, for the protesters, “Japanese” should not be understood as Japanese citizens per se but as Koreans serving others and selling out their nation. Hence, if one views the othering of the president simply in terms of anti-Japanese sentiments or ethnic nationalism, one misses the Candlelight participants’ maneuvering of dissident nationalism for an alternative agenda. They viewed their efforts toward a democratic civil society as part of a historical continuum tracing the Korean people’s unaccomplished project of self-determination after liberation. In addition, they determined the national boundary themselves based on their views of Korea’s democracy: just as the Korean government treated those whom they deemed to be illegitimate with brutality in the name of anti-communism, so the participants in turn disqualified the government from their nation-state because its vision of a democratic Korean society was irreconcilable with theirs. If the Candlelight protesters excluded the current government and the establishment from their national community, they also made use of self-censoring and exclusionary mechanisms for controlling the internal boundaries of the process of re-imagining their community, just as similar communities have done elsewhere. In my discussion of the internal boundaries within the anti-government forces, I concentrate mainly on the issue of the Candlelight protesters’ failure to represent the concerns of the underprivileged as well as on their discourse of purity. Here, the “rhetoric of purity” can be defined as the protesters’ desire to frame their activism as an ideal practice of democratic citizenship that makes no concessions to conventional politics.58, ed. Dangdae pip’yong (Seoul: Sanchaekja, 2009), 110.] Although the Candlelighters controlled their boundaries as a way of creating a new politics, doing so unintentionally resulted in ignoring the interests of the people who most needed their attention and in diminishing the Candlelighters’ radical potential for social evolution. Many people noted that “newness” and political radicalism were articulated when the Candlelight girls brought their voices together. Junior high and high school girls have no formal way to intervene in the political decision-making process, so their lives have been very much determined by adults’ votes or the government’s decisions. For instance, the students are at school from 7 a.m. to 11 p.m., including regular class time and the preparatory after-school academy. Nevertheless, the Ministry of Education has often changed the format of the university entrance exam without giving much thought to the long-term consequences, causing great confusion among students, teachers, and parents.59 In these circumstances, the students have no say but are expected to modify their study plans accordingly. Also, in the job market, teenagers as well as those in their twenties are exposed to serious exploitation, but there was no discussion of, or consensus on, the problem of teenage labor, not to mention any guarantee of a living wage. In the Candlelight cultural festivals, these teenagers, who had not been heard, voiced their concerns—concerns shared deeply by many Koreans—with acerbic wit. The teens’ emergence indicated that their subaltern position had the potential to connect the diverse issues of other underprivileged groups (e.g., temporary workers and migrant workers) through their shared, unacknowledged rights as citizens. However, as many observers complained, instead of listening to these grievances, the parent generation of the Candlelight Girls took over the students’ activism and changed it into a middle-class (consumers’) movement with its own issues, which caused many disadvantaged people to feel alienated and ignored. However, this does not mean that the Candlelight protesters intended to exclude other underprivileged Koreans in the protests; many groups of citizens freely joined the protests by merging their issues with those of the protesters, as in the case of the Freight Carrier Solidarity. It is not my intention to argue that the exclusion of temporary workers was owing to their incapacity to incorporate their issues in the general agenda of the Candlelight Vigil protests. I refuse to perceive the Candlelight protesters’ innate conservatism as stemming simply from the middle-class status of many of its participants; instead, I contend that the perceived exclusivity might have resulted from the fact that the Candlelight participants were not successful in conceptualizing neoliberal problems at the level of socioeconomic structure, or from their hesitation to do so because such an attempt could be easily seen as the expression of an ideological inclination toward the left, relegating the protesters’ efforts to the binarism or partisanship of conventional politics. In addition, the Candlelight protesters’ conceptualization of the neoliberal problem in terms of everyday issues is very much circumscribed by the nature of the online network that the protesters actively mobilized for their activism. The online network connects diverse issues in a horizontal and endlessly open manner instead of linearly and hierarchically. The difference between the horizontal and linear ways of linking various issues might be translated into dissimilarity between the Candlelight protesters and the earlier dissidents in their approaches to South Korea’s socioeconomic problems. 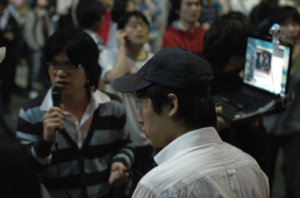 While the dissidents attempted to understand the Korean people’s predicament at the structural level, in the information age the protesters connect their issues through the online network. The Candlelighters’ careful positioning (bringing the neoliberal problem home in the form of everyday issues), as well as their networking, helped to create a fluid dialogical space between various groups of citizens and introduced a new way of working on varied yet intertwined issues, embracing the painful realities of other citizens as their own. Nevertheless, by addressing their deteriorating lives as everyday issues rather than as a fundamental structural problem, the Candlelight protesters could not effectively intervene in the current socioeconomic system and failed to represent the needs of those who were suffering most from economic insecurity. At the heart of the Candlelight protesters’ insistence on looking at neoliberal problems as everyday issues was their strong desire to envision their politics as distinct from existing state and progressive politics. 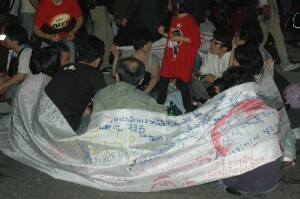 In the development of the Candlelight Vigil protests, many people pinned their hopes on the emergence of a new democracy through discussions on Daum Agora, through the people’s voluntary participation in politics, and through the political discourses that directly touched on people’s everyday lives. Hence, by aligning the Candlelight participants’ national community with the image of ideal communities, they wanted their activism and community to be conceived as the vanguard of a new social experiment. They refused to fall in line with conventional politics, a system of which they were suspicious and which they detested. The Korean scholar Yi Sanggil explains the protesters’ desire to create new political ideals and subjectivities through the concept of “the morals of purity.” He argues that the morals of purity operated at multiple levels in imagining and realizing the Candlelighters’ community, as well as in their interaction with the dominant discourses.62 Nevertheless, I will limit my discussion of the Candlelight participants’ refusal to be “political” in relation to the rhetoric of purity and its limitations. 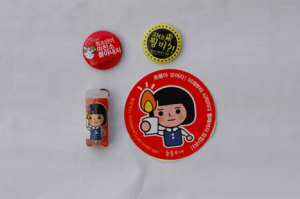 Yi Sanggil approaches this ambiguous concept, the rhetoric of purity, by looking at the icon of the Candlelight Vigil protests: the Candlelight Girl. The Candlelight Girl is a representation of a cute young girl in a school uniform, presumably a junior high school student, who initiated the Candlelight cultural festivals. The Candlelight Girl’s stylized body, innocent yet determined facial expression, rosy cheeks, and the large candle she holds all help to evoke feelings of innocence and youth that made adults feel protective.63 The Candlelight Girl was popular among various groups of Candlelight protesters, and its image was widely circulated on stickers, leaflets, posters, T-shirts, and so forth. Along with the Candlelight Girl’s image of purity, the junior high and high school girls’ active participation in the Candlelight cultural festivals helped people to conceptualize a new democracy in everyday civil discourse: the “adults” were learning a new way of engaging in politics while they were listening to other people’s diverse issues with laughter, applause, and sympathy. Figure 6. The Candlelight Girl. Photo by Kim Yunki. Although Yi Sanggil’s reading of the Candlelight Girl is convincing, I wonder if it brings the movement back to the grown-ups’ bosom and too easily equates the students’ self-representative activism with their image of “purity” and “innocence.” Instead, I argue that the Candlelight Girl should be understood more in terms of “playfulness” and “mischievousness,” distinctive qualities of children as well as of the Candlelight participants’ engagement in current politics. Thus, I propose that the ideas of “purity” and “innocence” should be examined in the context of the Candlelighters’ playful activism and their self-representative democracy. In addition, the Candlelight participants’ discursive logic of “pure” and “impure” or “contaminated” could be hijacked by the government and conservative news media all too easily and rhetorically altered to control the Candlelight protests.65 The pro-government mass media deployed the rhetoric of “purity” and “contamination” as the criterion for distinguishing “good” protests from “bad” ones. For instance, a May 27, 2008 editorial in the Han’guk Daily newspaper showed great concern that the Candlelight Vigil protests arose from the people’s voluntary expressions against government policies but were spoiled by labor unions and civic groups and became just like the general anti-government political struggles of the 1980s. The conservative newspaper Chosun framed the citizens’ protests against mad cow as a “pure-hearted” reaction, while their overall opposition to the government’s policies was “impure” and “contaminated.”66 By viewing the labor unions and civic groups as corrupt forces going along for a free ride, the news media attempted to deny the Candlelighters’ radical potential. Nevertheless, the protesters’ vision of their activism as “pure” could result in sustaining, however unintentionally, the logic of the state authority’s suppression as an act of separating contaminants from the rest of the population.67 It is ironic to see that the protesters’ attempt to place their politics outside the framework of existing politics in fact became a good excuse for the government’s usual oppression of dissident movements. The intersection of Gwanghwamun, where the barricade stood, was transformed into the Candlelight protesters’ “playground,” or a liberated area in the spirit of the community formed by the Gwangju people during the May 18 Gwangju Uprising. The Candlelight participants, who had organized street protests from the direction of Seodaemun, the Seodaemun police agency office, Angukdong, and so forth, flocked to the Gwanghwamun area. In every quarter, people were participating in diverse cultural activities, such as pungmul performance (traditional Korean percussion music accompanied by dance) and small-scale musical performances. Also, there were impromptu forums to discuss future Candlelight activism. The Candlelight protesters consisted of various groups: college students, junior high and high school students, labor union workers and farmers, fathers and daughters, babies and mothers, nuns and monks, and artists and performers. Although the June 10 Candlelight Vigil protests took place simultaneously in several major cities of South Korea, the focal point of the Candlelight Vigil protests during the three month-long period was Seoul, South Korea’s foremost economic, political, and cultural center. As much as the lengthy duration of the protests was a major factor in the limited geographical diversity of its participants, it also reflects the aforementioned middle-class status of the Candlelighters. One middle-aged man took a picture of the Candlelight Tower in front of the DongA Daily News building, saying that he was waiting for his daughter, who would arrive after work. He commented: “[The Candlelight Vigil protests] remind me of anti-Yusin protests in my school years [1972–1979].”68 Another citizen commented: “It is like a night market. As Lee Myung-bak became president, ‘Lee Myung-bak cultural festivals’ were created.”69 Also, a woman who worked in the area said: “Although President Lee couldn’t communicate with the citizens, [he] helps the citizens to communicate with each other beyond generational differences.”70 This diverse body of people articulated a sense of everyday life by re-creating their daily interactions with ordinary people in a public space. Likewise, the mingling of the various generations and their memories among the protesters revived the people’s struggle for their nation-state. This diverse representation helped them to conceptualize their long debate as an exercise in democratic citizenship. Figure 7. Gathering of Family and Friends. Photo by Kim Yunki. Figure 8. The Citizen’s Fortress. Photo by Kim Yunki. These conflicting positions were not resolved, so for a time the citizens tried to decide by clapping. Several participants who were trying to assert their opinions were even shouting and pushing, which concerned others. In the end, several people, mostly students, climbed to the top of the barricade and shook their banners as a symbolic gesture against the government.73 Although they could not reach any concrete consensus, many citizens were satisfied with the peaceful end because they had shared their opinions on the protests and had been able to influence its direction through a democratic process.74 This discussion was not only about the citizens’ collective contemplation of the future of the Candlelight Vigil protests; it was also about the democratic process of decision making. Thus, they perceived their performances as an alternative to or necessary interventions into current Korean politics. This brief encounter revealed the tension between the appearance of Korean nationalism and its reality and aspirations in the global era.75 In South Korea, only in part because of its long history of state oppression, as Song Tuyul and others have noted, the national division into South and North Korea and the complex international politics surrounding the Peninsula made it impossible to easily abandon nationalism even in the global era.76 Furthermore, the country’s division has created an unusual space in which nationalism and globalism are both competing with and reinforcing each other. Hence, in the globalized world, it is crucial to reinterpret and rework Korean nationalism as a creative process of examining one’s existence and intervening in the disjunctions between democracy and the market. The protesters reinvigorated their national community’s enthusiasm to fight against the neoliberal restructuring of their life. However, they cautiously re-imagined it in a democratic civil society that not only embraced the Koreans’ aspirations to create a just society, but which also opened itself to the possibility of global collaborations that seek to transform the fundamental condition of the economy. These goals were not explicitly articulated in the protests. However, the Candlelight protesters showed that they were interested in creating a dialogue with others and in seeking international support for their causes. In fact, these charges frame the anti-Candlelight protests within the earlier conflicts between nation-states. Those leveling the charges failed to see the United States as a global hegemonic power and so could not recognize the Candlelighters’ Korean nationalism as an intervention into multiple complications created by the contentious relationship between nationalism and transnationalism. In spite of the protesters’ eagerness to communicate with the international public, it would be too optimistic to say that they intended to expand their protests into an international people’s movement. However, the Candlelight participants did demonstrate the potential for transforming nationalism into a point of convergence for transnational collaborations to re-envision the globalized world and to work for a common political agenda in a collective manner. The Candlelight protesters engaged in a collective re-envisioning of the Korean national community to create a democratic civil society and to intervene in the debilitating process of neo-liberalism. To re-imagine their nation-state, the protesters mobilized their form of nationalism by selectively engaging with earlier forms of dissident nationalism, while opening up new possibilities for international collaborations and overcoming some of the limitations of dissident nationalism. However, we can also see that the Candlelighters ran up against certain limits: a lack of attention to the representation of the underprivileged, their failure to form a new political subjectivity, a new political figure that could act on and transform twenty-first-century Korea’s socioeconomic system; the Candlelighters’ appropriation of the Constitution as justification for their activism and their lack of political alternatives;80, in Kuedaenun we chopureul kkeusyeonnayo [Why Did You Extinguish Your Candle? ], ed. Tangdae pip’yeong (Seoul: Sanchaekja, 2009), 84.] and the separation between the progressives and the citizens, as well as that between the representative political system and street politics. Following the Candlelight Vigil protests, some were skeptical of the extent to which the movement had advanced the democratization of society, particularly because of the tightened government control that followed, including the pressing of charges against some “violent” Candlelight protesters and the revised media legislation that followed. Despite these challenges, the Candlelight Vigil protests demonstrated great potential to radically rethink and reformulate nationalism as a new people’s collectivism in the globalized world. I would like to thank the editors Godfre Leung and Sohl Lee, and other readers for their meticulous reading of my paper and their feedback. I also would like to thank Claudia Pederson and Soraya Murray for reading my draft and sharing their ideas, Thembinkosi A. Goniwe for introducing me to several essays on South African literature and culture in the 1980s, and Kim Yunki for his wonderful photos of the Candlelight Vigil protests. Previous PostBetween Absence and Presence: Exploring Video Earth’s What is Photography?